"Placing your child on the toilet immediately, will help them link cause and effect more quickly and effectively and achieve greater potty training success. " I'll admit, I was a little skeptical of this. Mostly because of my child's personality of not caring if he's got a nasty diaper or not. I also thought he would rip the sensor off, but he didn't seem to care. In retrospect, it actually seemed like he thought it was cool. Boys lol! I was pleased when the alarm went off and it was finally like he got it. Later on when I had put him in bed without the alarm (it's not recommended using the alarm at night, although you can), he called me to his room and indicated he went potty. This is not my child's usual behavior, but hopefully this will be my child transitioning to wanting a dry diaper, and wanting to use the toilet. *sigh....wish me luck! We can do this right!? Although he isn't fully potty trained yet, I'm hopeful if I remain consistent with using this product, and follow the directions he could be. Wanna try these awesome diapers out with your potty-champ to be? Pick them up at select stores or on Potty Control's online site. Starter boxes are $29.99 and refill kits are $19.99. Another option....WIN some! 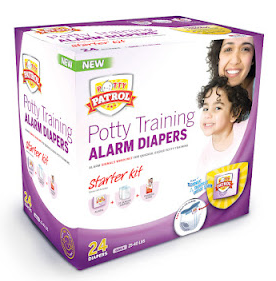 a Rafflecopter giveaway Giveaway will end August 20th at 11:59 p.m. EST I was given Potty Training Alarm Diapers from Potty Patrol to review. No other compensation was received. All opinions are my own. This promotion is in no way sponsored, endorsed or administered by, or associated with, Facebook. We hereby release Facebook of any liability. Winner(s) will be contacted by email 48 hours after the giveaway ends. If you have any additional questions - feel free to send us an email! The little alarm is genius! I hope I get to see if they work on my daughter! I did not know that diapers stay in a landfill for 300 years! This is neat. I am potty training my son now and I think this would really help. I like the idea of how it plays a song when they start to go so you can get them there when they need to go. The censor thing is great,and we do need to potty train my grandson.Our other grandbaby is due in 6 days! In four months, I am planning to start potty training for my daughter.. I like that these alarm diapers would save lot of time in the process. I love that Potty Patrol reduces the need for random sits on the potty! I've heard it's not good to tell them to sit on the toilet until they go. The creators had 9 children! Very cool post, aimee! Love it. I love that it lets you know right at the beginning of the wetting incident. I love the alarm for kids to associate the deed with the potty to have less random potty sitting. they encourage potty training success! I really like that Potty Patrol reduces the need for random sits on the potty that many children interpret as punishment. I know they don't recommend using them at night, but my boys only wear training pants at night - and I think this would help them learn to wake up during accidents. This is a great idea! A sensor? Genius! We are at that stage right now as well! I love that it lets you know when they are wet, so that you can hurry and take them to the potty. I have been frustrated trying to train a child who doesn't seem to care too much. I would love these! I think it would make a huge difference in our progress. I love that they are disposable! Great that they are disposable. I would give this to my sister. She would love them for her son. I need these! It won't be long before my 18 month old will be potty training! I'd like to try these for my son! hope to win these for my 2 yr. old granddaughter Lucy. They are having a tough time potty training. I like that these make potty time seem more like fun than a punishment. 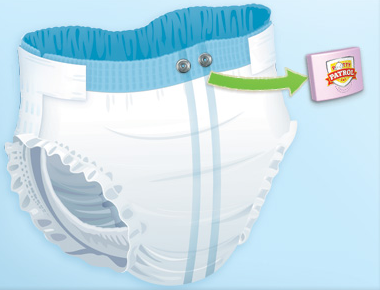 I visited the site and I like that these diapers are more eco-friendly and help save the earth! I like that Potty Patrol can help free you from the financial burden of diapers by helping your child become potty trained more quickly and easily. I did not know that diapers stay in a landfill for 300 years thats horrible so better get this potty training over asap. I love that the sensors are reusable...makes for more cost effective product!!! Potty Patrol can significantly reduce the waste that is being created by current diapering habits. I'm skeptical. I've used a clip on potty alarm before with my eldest child during the night. The alarm sounds when moisture is detected yes, proceeded with a disoriented scream. I am interested in trying these with my youngest child. An innovated idea for daytime use! My little one is day trained, but I still use diapers at night. But My friend is just starting with her daughter. It would be interesting to see how they would work for her. Why is it not recommended for night use? I would like to try it and see. It is a great idea! I like the idea that you and the child actually know when they pee because that's the hardest thing to figure out with a diaper on! I like that the alarm is a gentle song to remind them that they have wet themselves and not a harsh alarm sound. I like the "alarm" idea to let you know when they wet themselves so you can go sit them on the potty. Best reason is to make the connection between cause and effect more quickly and effectively. I have never heard of these and think it is a great idea. We are still having trouble with night time wetting, so think these would be fantastic...I did not know that dispos. diapers stayed in the landfill for so long! Reduces having your child sit on the toilet at random times. The reusable sensors are awesome! I like that it notifies the parent when the child is wetting and not after the fact. This is a great concept! Very Genius! The alarm is a great idea!! I like that you know right when to put your child on the potty. I would love to try them out. I love that the alarm not only notifies the parent but also helps the child link what she has done with being on the potty. We just started potty training our daughter this weekend so these would be awesome! I LOVE LOVE LOVE the entire concept of these. I believe that these would definitely finish up training my young niece. I also love that the alarm itself is reusable. Genius!!! I enjoyed browsing their site, and think they have a fantastic idea.